Scott Adams makes a compelling case that Donald Trump is a “master persuader”…perhaps the best of all time. Adams is sure of this as he also considers himself in that circle. Again, Adams is not a Trump supporter, but his prediction was pretty solid. Trump even survived that late in the election locker room tape with Billy Bush. It didn’t hurt that his opponent was perhaps the worst candidate ever (my opinion). I do appreciate his open mind on some issues, a quality that you don’t often see these days. I am not a New Yorker, but I had felt all along that Trump was the quintessential New Yorker…brash, unapologetic, and desiring to win. I think that he has demonstrated a willingness to work with Democrats and never-Trumpers to get work done, essentially making a deal. That’s not really happening. Like him or not, he is stirring up D.C. politics which it desperately needs. I really enjoyed this book. Sadly Mr. Adams describes how he, at a point in the race, had to change his prediction because he and his family were receiving death threats. He also lost most of his speaking engagements because of his prediction. He ultimately went back to his prediction, but it is sad that there are folks who feel comfortable making death threats… cowards that they are. This article was published on Mar 25, 2019 . 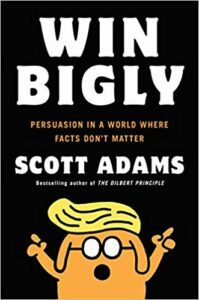 It is tagged scott adams, trump, win bigly. You can follow any responses to this article through the comment RSS feed.